The Dow Industrial Average closed at a record high on Thursday, but across the pond financial markets are singing a different tune. The Eurozone appears headed into another recession and traders are hedging their bets by selling European stocks. 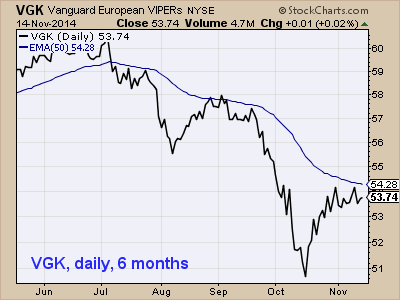 Vanguard FTSE Europe (VGK), a $17.4 billion exchange-traded fund that serves as my proxy for the European stock market, rolled over in June and has fallen 5.3% so far in 2014 (top chart). After such a smooth run-up over the prior 24 months, you can’t really blame investors for taking money off the table (middle chart). 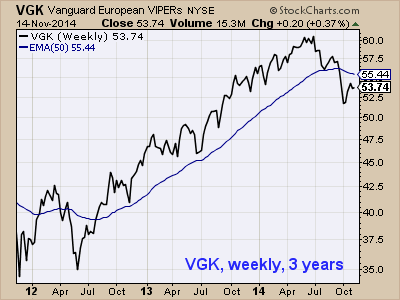 Is Europe’s correction temporary? 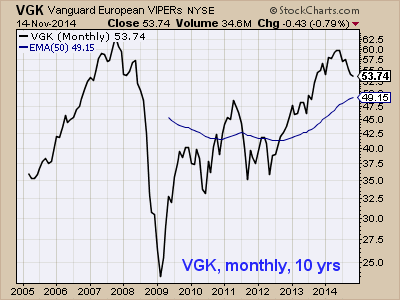 It’s too early to discern if this is the beginning of a European bear market, but the fact that VGK couldn’t take out its 2007 high (bottom chart) is troubling. My newsletter’s timing model for the European Funds generated a sell signal on July 8.